He released his first solo album, “Classical” in 1997, which I found a treasure chest of musical magic from the first listen. Eleven songs sit next to each other in the chest just like some colourful and shiny jewel stones, each of them with its own unique colour and charm. 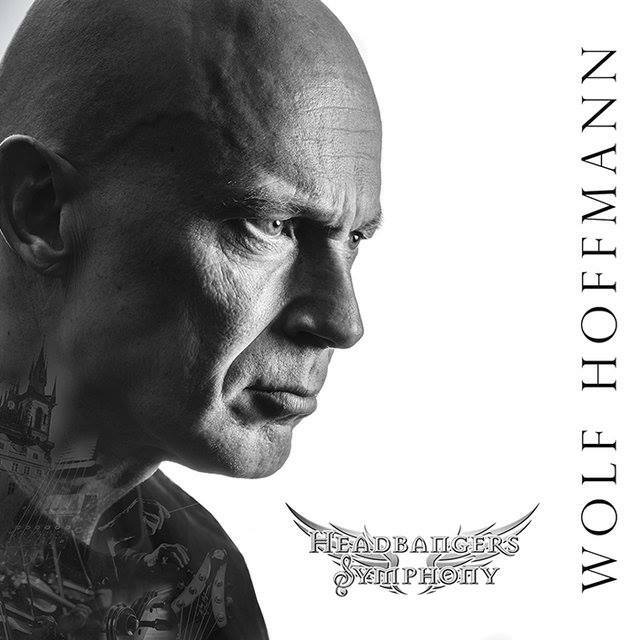 So it is indeed great to see that Wolf Hoffmann is going to release another solo album, which is entitled reasonably “Headbangers Symphony”. It has eleven songs in its track list too and it is set to be released on 1st July 2016. Let the classical music rock, ‘Scherzo’ is the first in the line and it is not a “joke” at all. It is a heavy metal adaptation of the very famous second movement of Beethoven’s Symphony No.9. ‘Scherzo’ is an extract of music from a larger piece, often in 3/4 time and here comes the challenge, as heavy metal music is usually written in 4/4. This sounds like a victory as Wolf could win the challenge and also he made it back with his second solo album. I know why Mr Hoffmann chose this beautiful piece of art as the first track; this song is as memorable and magnificent as ‘Teutonic Terror’, the riff of which you can easily recognise here. How can I forget that epic moment when ACCEPT came back with the “Blood Of The Nations” album and now Wolf Hoffmann’s ‘Scherzo’ promises one more great restart! The second track in this album is ‘Night On Bald Mountain’ where maybe Wolf Hoffmann’s sense of humour is limited only to the title, as the music is very serious. I always see colours or sometime even more complex, some pictures or images when I am listening to music. Whilst listening to this track I see images of burning magma upon a high mountain, with a very strong wind. The images continue with some anxiety and anguish type feelings and I suddenly find myself with no limits of time or space, “OMG!” I can see the whole of the human’s history of pain with the eyes wide shut and witches dressed in black are escorting me. It is absolutely a great version of Mussorgsky’s ‘Night On Bare Mountain’ and Wolf was brilliantly successful to connect it to the next song by an invisible bridge, made not by music but by feelings. ‘Les Pêcheurs de Perles’ is indeed one of the most famous and emotional pieces in Western opera by Georges Bizet. Wolf Hoffmann’s adapted version of ‘Act 1’ of this masterpiece, ’Je Crois Entendre Encore’, is like a peaceful dark blue sea under a pale blue sky. While the waves are moving by the soft hands of the wind, I feel like a feather drowning in a limitless ocean of tears and emotions. Vivaldi’s music has always been a symbol of the harmony of life to me. The next track on “Headbangers Symphony” is ‘Double Cello Concerto In G Minor’, where Wolf delivers a headbanging version of Antonio Vivaldi’s masterpiece, with almost the same name. As I followed and observed ACCEPT’s work precisely, this song must be a special song for Wolf, as they always seem to place the most special song as the fourth track in their track lists, at least on their albums from 2009. The coordination between Wolf Hoffmann’s guitar and other instruments, especially the orchestral ones, is stunning, so much so that I started to think that Mr Hoffmann tried to have a musical discussion here with Mr Vivaldi. Jimi Hendrix was the first one who could sing with his guitar, Ritchie Blackmore was the next one and Wolf Hoffmann belongs to the next generation and to those where not many can do the same and that is the most necessary skill for playing the next song, named ‘Adagio’. I have always thought that Tomaso Albinoni was a kind of super-human or an alien as I can hardly believe his ‘Adagio in G minor’ is a work of mankind! Indeed, Wolf Hoffmann was successful to create a new version of this masterpiece with his signature of playing the electric guitar and the instrument arrangement. Absolutely loyal to the main theme, but he manages to bring more emotional feelings into it. The peaceful music flows through my mind and with my closed eyes I find myself somewhere far far away from this galaxy. The sixth track in the list, ‘Symphony No. 40’, is my favourite one and after lots of efforts of searching different dictionaries I still cannot find the words to describe it. This masterpiece is ten times more magnificent than magnificent with indescribable elegance, Wolf Hoffmann created such an uplifting piece of neoclassical metal music. This adaptation of Mozart’s ‘Symphony No.40’ will give a huge amount of joy to both classical music lovers and also metalheads around the world! No matter if the love between Odette and Siegfried was strong enough to defeat the curse or not, their story is one of the most romantic. Pyotr Ilyich Tchaikovsky’s ballet “Swan Lake” was and still is indeed an inspiring piece of art for many musicians and perhaps you have heard a few different versions by different artists. Now, luckily we have Wolf Hoffmann who brings us a unique one. The tempo is a little bit higher which makes it more rock and roll style at the beginning, but it will also go further and become a traditional heavy metal piece of music and you can find Wolf’s trademark through the whole song. The next track in the line is another beautiful piece of art, “Madame Butterfly” which is a power ballad adaptation of Italian composer Puccini’s opera of the same name. The emotive electric guitars backed by drums create such a dreamlike and stunning atmosphere from a drama story, of which you will not have heard a version such as this before. In this album, Beethoven rocks. two head banger heavy metal adaption songs from his symphonies are created by Wolf like three powerful monsters who are ruling this fantastic world. ‘Pathetique’ is the title of the ninth track in “Headbangers Symphony”. Wolf seems to have found a tunnel in time and brought back 27 year old Ludwig to strike the heads and bang them furiously with a new exceptional version of ‘Sonata Pathétique’. Perhaps after some hard rocking and rolling, you may need to give your necks some rest, so here comes ‘Meditation’. It starts with an aura of peacefulness with the piano and electric guitar, so just close your eyes, relax and follow the music to eternity. This adaptation of Jules Massenet’s ‘Méditation (Thaïs)’ is as good as the original one, except that it is an overdriven guitar singing instead of the solo violin. You may have had those emotional moments when you had to leave a beautiful place or a good friend but you didn’t want to and the last piece evokes that kind of feeling. The final stage of this awesomeness is ‘Air On The G String’ where Johann Sebastian Bach at last joins the party, just to say farewell and close the curtain. Wolf played the guitar perfectly and smoothly which may leave some tears on your eyes. But don’t get too upset, there is always a replay button to press! It is all about balance, good or bad, black or white, happiness or sadness … this world’s nature demands balance and it is what you can find in Wolf Hoffmann’s second solo album perfectly too. There are soft and mellow songs and there are also energetic and heavy ones, so almost everything your nature needs. “Headbangers Symphony” is not only a wonderful musical album, but it is a healthy food for beautiful souls and minds and it is one of those albums which you want to listen to over and over again. DAKESIS are a four piece progressive power metal band from Birmingham, UK. Formed in 2008, with the release of a limited edition four track E.P they soon followed on with their debut album “Trial by Fire” in 2011 to much critical acclaim. Following on from the success of this album and extensive touring and festival appearances throughout the UK, including an acoustic performance on the Jagermeister Stage at Bloodstock Festival in 2012 and also performing at the Valkyrian Festival plus a headlining slot on the Cackblabbath Stage at the Wildfire Festival in 2015, the band went on to record their second full length album “The New Dawn” which was released in March 2016. On track three, ‘Betrayal’, which features guest vocals from Matt Gore of The Mighty Wraith, DAKESIS vocalist Gemma says “We really wanted to create something theatrical, and Matt was the obvious choice for us when it came to finding a booming male vocalist who could play the role! We had brilliant fun in the studio with Matt, and can’t wait to perform live with him at the album launch and any time our paths might cross out on the road!”. There is another duet on the album in track ten ‘Autumn’, featuring joint lead vocals by the DAKESIS drummer Adam Harris. All the song were written and performed by DAKESIS except track two, ‘The New Dawn’, which was written by DAKESIS and Wayne Dorman. This latest release was recorded at Carbon Studios in Birmingham and mixed by Nino Laurenne at Sonic Pump Studios based in Finland (Ensiferum, Wintersun, Stratovarious and Firewind) and sees a marked change in the direction of the band. With more progressive influences and the addition of powerfully epic orchestral backing alongside new session. The album starts off with track one ‘Overture: The Darkest Hour’ in which is an epic instrumental building up to track two ‘The New Dawn’, which bursts into life with high speed drums, crunching guitar riffs and outstanding vocals that instantly get me nodding my head. DAKESIS have given our ears the true sound of UK power metal in all its glory in this track, Lawler’s vocals take you to different place. Tracks two and three are ‘Betrayal’ and ‘Destined For The Flame’. ‘Betrayal’ features guest vocalist Matt Gore (The Mighty Wraith) and the guitar work from Jones is up there with the best for all to hear and it takes your breath away. The song slows down near the end with a bit of piano then finishes strongly. ‘Destined For The Flame has galloping drums and guitars and again Lawler’s vocals are a joy to behold, they are so captivating along with the guitar solo from Jones bringing it altogether. Tracks five and six are ‘The Great Insurrection’ and ‘To Conquer Or Die’. ‘The Great Insurrection’ is the first single to be released from the album and they could not have made a better choice. It is full of outstanding guitar riffs and solos from Jones, creating power metal at its best, The song is testament to how far the band have come over the years. The vocals from Lawler are outstanding and it has a great beat holding all together, combining the drums of Harris to the bass of Chatterley. For the beginning of ‘To Conquer Or Die’, the band had The Birmingham Rockschool Choir chanting with some strings in the background pulling it together, then it bursts into life with a guitar solo from Jones, before the vocals kick in pulling it together nicely. Track seven and eight are ‘Intermezzo: Meridian’ and ‘Judgement Day’. ‘Intermezzo: Meridian’ is the shortest of the main songs on the album, but this instrumental is just is full of passion and reminds me of Nightwish in the way it is delivered which I love. It gives that break you need in an album like this. ‘Judgement Day’ is a strong ballad which begins with a piece of slow guitar and bass work, the vocals are a bit slower but delivered perfectly. The track does pick up pace a little bit half way through and I can really hear the passion in the music and the vocals. Tracks nine and ten are ‘The Sacrifice’ and ‘Autumn’. ‘The Sacrifice’ has a piano intro by Jacob Underwood and Lawler’s choral vocals which is the slowest song on the album. It is delivered brilliantly, mid way through the pace picks up speed, which instantly gets my foot tapping away. ‘The Sacrifice’ is beautifully delivered along with fantastic vocals, guitar solos and pounding drumming along with the bass. ‘Autumn’ is an acoustic piece of gold, enriched with orchestrated pieces and beautiful full vocals. The second half of this album shows how far the band has come in exploring the progressive elements of the genre. Moving on to ‘The Seventh Sky’, a 17:50 minute epic which just flies by, it is full of strong lyrics plus great solos and riffs that makes this one of the best songs I have heard of this type in ages. ‘Call to Freedom’ starts with an acoustic guitar then bursts into life with heavy guitar and some chanting in the background, then the vocals kick in and they are as strong as you can get. The guitar work by Jones is second to none, as it has been on the whole album. The tempo does slow down near the end but it fits the song perfectly then the tempo quickens in the final stages of the song. The thirteenth and last song is ‘By the Fading Light’, which starts off slowly then builds up and it is a fitting end to a top quality album which has some brilliant acoustics mid song. Also the piano and Lawler’s vocals are just fantastic throughout. Overall this is one of the best albums I have heard this year. It is full of strong vocals, a great rhythm section and I feel it is an album that can stand the test of time. Passion can be heard in every chord and every note on this album, resulting in my high rating. DAKESIS in their genre are right at the top of the class. So don’t delay, go buy this album. BEHOLDER are a British Heavy Metal band from the Midlands. In 2009 they released “The Awakening” and since then they have been praised by the media and fans, relentlessly touring in the UK, Europe and Scandinavia, building a healthy fan base wherever they go. In 2011 with the addition of Scott Taylor to the fold, they embarked on a project to build a new album with power and intensity which was released in 2013, titled “The Order Of Chaos” with 12 tracks of blistering music that turned heads everywhere. Three years later the band have now completed “Reflections”, comprising of ten songs of unadulterated metal to enjoy. The album kicks off with ‘Frozen Steps Of Utøya’, which begins with a ticking clock then straight into a guitar riff from Scott Taylor and with a solid drum beat from Chris Bentley, which grabs my attention straight away. The song is a classic heavy metal song with good riffs and classic vocals of Simon Hall, which sets a quality tone to start the album. The second and third songs ‘I. Machine’ and ‘Heal the Wounds’ follow the same high intensity that BEHOLDER have given their fans from day one. The tracks feature quality guitar work along with pounding drums and harsh vocals, but what I really do like is the ending on ‘I. Machine’ – quality soft guitar riff work with a touch of the cymbals and a mix of soft vocals, which demonstrates the versatility of the band. ‘Heal the Wounds’ has got some really solid solo guitar work, along with the vocals which change from harsh to clean from Hall witj backing vocals from Si Fielding. Mid way through the song there is a top notch guitar solo from Taylor which BEHOLDER are known for. Moving on to track four, ‘Host’ is a song which has some stunning guitar work and a fast drumbeat which then settles into a mid-paced number, with vocals well delivered throughout. It makes way for tracks five and six, ‘Dance Macabre’ and ‘Breathe In Silence’. ‘Dance Macabre’ starts off with a good strong drum beat from Bentley along with a heavier guitar riff from Taylor, Hall’s vocals are more intense and delivered with a slower style in this song, giving it the edge it needs. ‘Breathe In Silence’ begins with the volume low, slowly increasing, with more quality riffage from Taylor along with a strong drumbeat, then Hall’s vocals kick in with menace and I can’t help but start to bang my head to it. Tracks seven and eight are ‘Killing Time’ and ‘Army of One’. ‘Killing Time’ has a different feel to it than the other songs on the album, being slower paced with a long instrumental before Hall’s vocals come in, but it holds its own on the album which I like. The track really contributed to the strength of “Reflections”. ‘Army of One’ is a well delivered song, with quality guitar work from Fielding and Taylor and the vocals are top class from Hall, all brought together by the pounding drums from Bentley. Track nine and ten are ‘My Revolution’ and ‘Speak To Me’, ‘My Revolution’ starts with a high intensity drum solo from Bentley, giving way to Hall’s commanding vocals in the middle of the song, which are melodic and then back again along with some top quality guitar work from Taylor throughout and is probably my favourite on the album to be honest. ‘Speak To Me’ is what I would call a perfect end to an album – Taylor‘s guitar work gives this track its own identity, the flanged guitar giving the start a bit of an edge, then the pace hots up. The track comes to life with the guitar riff and pounding drums from Bentley, combining these with Hall‘s killer vocals, giving everything he has, combine to end the album perfectly. “Reflections” has been a long time in development, but damn it has been worth the wait from the band at the forefront of UK Metal. The BEHOLDER crew did not hold back and they are getting better and better with every album. If you have not got a copy yet why not buy it, you will not be disappointed! All musical content written, composed and arranged by Taylor, Bentley and Fielding. For more information on BEHOLDER visit this location. I first discovered epic Finnish progressive metallers AMORPHIS back in the “Tuonela” days of 1999. They fast became one of my favourites and have always blown me away with their live performances. Moving forwards to the band’s 12th album release in 2015, “Under The Red Cloud”, it achieved impressive chart results all around the world, including their first ever entry in United Kingdom and Australia, as well as their highest ever entries in Germany, Switzerland, Austria, Belgium, the Netherlands and France. I last saw AMORPHIS at Bloodstock Open Air in 2013, so jumped at the opportunity to go and see my favourite Finns on the last date of their tour in Ireland and the UK at The Rescue Rooms in Nottingham. Prior to the show, I had interviews with Tomi from AMORPHIS and Uri from TEXTURES, so I just caught the end of opening band, Greek prog metallers POEM. I hadn’t heard them before and was impressed with what I saw – quality music with great stage presence, I look forward to hearing more. After a short break, the next band on stage were modern prog metallers from the Netherlands, TEXTURES. I didn’t catch the whole performance but what I experienced was a great crowd pleasing show. The band were full of energy, delivering a finely honed and tight performance, featuring tracks from their new album “Phenotype”. On to the main band of the night! The venue seemed to be pretty packed from my view at the front, with the crowd cheering for AMORPHIS to make their appearance, the stage adorned with the stunning album artwork on all sides. Each band member appeared on stage one after the other, accompanied by a prolonged introduction to ‘Under The Red Cloud’, which went down well with the Finn loving metal crowd! The opening three songs were all new and I’d been dying to hear them live, they didn’t disappoint! ‘Under The Red Cloud’, ‘Sacrifice’ and ‘Bad Blood’ set the tone for the next hour and a half, our eardrums were treated to the unique sound that makes AMORPHIS sound like nobody else in metal. Tomi Joutsen‘s vocals were on fine form, flowing effortlessly between clean singing and growls, he also worked the crowd like the pro that he is. Lead guitarist Esa Holopainen‘s solos sounded perfectly melodic, he really makes that guitar sing! It was great to hear, but unfortunate that I could barely see him from my left side of the stage surrounded by giants! It’s a shame the stage in this venue did not allow for Esa, Tomi Koivusaari and Niclas Etelävuori to move around and swap sides, but entirely understandable given the size and the fact there are six band members. With a catalogue of albums stretching back over 24 years, it must be get a little more difficult with each tour to choose set lists, but some great classics were played during the show. ‘Drowned Maid’ from the epic 1994 release “Tales From The Thousand Lakes” stood out for two reasons – it was great to hear the dual vocals between the two Tomi‘s, complementing each other well. The other was the slight hiccup whereby the custom microphone Tomi J uses had a technical hitch and he had to use a standard one, which worked perfectly but looked quite strange! Quite rightly, there was a large cheer from the crowd when he came back with the one we know and associate him with. ‘The Wanderer’ and ‘Hopeless Days’ from the last album release “Circle” sounded excellent, showcasing Santeri Kallio‘s atmospheric multi-layered keyboard sounds, along with the crowd’s fine voice during the choruses. The whole rhythm section of the band is a real powerhouse backdrop complementing Tomi‘s vocals and Jan Rechberger‘s precision drumming creates a commanding presence. ‘House Of Sleep’ from 2006’s “Eclipse” was a splendid close to the show before the encores. And what an encore it was! Starting with the new opus ‘Death Of A King’, this is already high up in my top AMORPHIS songs of all time. I never tire of listening to it and to see the track performed live was stunning. Followed by the equally excellent ‘Silver Bride’ and ‘The Smoke’ to round off the perfect metal night. AMORPHIS – don’t leave it too long until you come back to see us in the UK!! Our recent interview with Tomi Koivusaari can be found at this location. Check out some photos from the show on the slide show below. SCHIZO have been pioneers of the Italian extreme metal scene together with Bulldozer and Necrodeath. SCHIZO was founded in 1984 and symbolizes one of the most important brand in Italian extreme metal scene. Originally released in 1989 in 12″ vinyl format by Crime Records, their “Main Frame Collapse” debut album is still cult among underground circles, so hard to find! Chuck Schuldiner, mastermind of legendary Death band was asked to join the band for the recording sessions of “Main Frame Collapse” in 1989; however, due to the intense activity with his band, Schuldiner was forced to deny the request. The band was on hold between 1999 and 2005. Their 2007 waited come back release, “Cicatriz Black”, has been extremely well received by critics and fans. In September of 2007, founding member Alberto Penzin decided to leave the band due to musical differences and personal problems with the rest of the band. He founded a new project called Camera Obscura Two. Then, Dario Casabona was named as new four strings player. By Scarlet Records, band released the third and last full-length album in 2010, “Hallucination Cramps”. “Rotten Spiral” gives us intense, perfectly timed, beautifully executed melodies/harmonies throughout the album, with some of the most cleverly mastered combinations between the instruments and vocals I’ve heard in a while. “Rotten Spiral” is a real fast paced and head moving album from start to finish. If you remember the old school greats in metal you’ll love this, with the track ‘Skeptic Flesh’, and those melodic sections delivering power so intense it’ll blow your head off. For me it was all about the solos, and they are brilliantly crafted, from the dive bombs and pitched harmonics to the tremolo picking, it does enough to make me smile. The title track ‘Rotten Spiral’ is brilliant, a real head mover throughout. Everything I’ve ever liked about metal in the last 20 odd years goes in this title track. Speed, Ambience, Power, Riffs to melt your mind, Vocally driven, and the solos to send shivers through you. Who does this appeal to? Personally I would say anybody who likes thrash/extreme with a little more edge than the usual bands out there. Have a listen to track 6 ‘Freikorps’ and you’ll be enticed to listen further, maybe even check out more of this band. Why? Because the band do what many bands have been trying to do for years, they make it work well. Can you combine extreme galloping, dive bombs, and alternative speed picking in the space of 20 seconds? Of course you can, and ‘Freikorps’ does this brilliantly. I’m not going to spoil it for you but the last track ‘Final Warning’ is the perfect finish for this masterful album. If you’re looking for a song to find that repeat button this is the track that will have this album repeating all day. Overall, this is an incredible album which would appeal to all metalheads looking for something more from their metal. Recorded and mixed by RIccardo Demarosi, and mastered by Giovanni Versari. SØNDAG were born in Italy from the ashes of the band Edema in 2015. The Band started as a duo with Riccardo Lovotti at drums and Marcello Lega at 8-strings and vocals, later Marco Benedetti (guitars) and Riccardo Demarosi (bass guitar and vocals) joined the band. SØNDAG’s musical concept is about promoting heavy “low-tuned” rock music with influences from all over the rock music scene. The EP gives us brilliant drone melodies throughout, with powerful, well paced music to attract the listener. A great combination between the vocals and the driven low keys keep us attracted to the music. You can definitely hear the ‘Nine Inch Nails’, ‘Alter bridge’ influences throughout, however with the second track ‘Keychain’ there are masses of Nickleback (not necessarily a bad thing when done well). The mix is perfect, and you couldn’t expect much better. I thoroughly enjoyed this short introduction to SØNDAG, worth keeping an eye open for. Between the harmonies and pace this really gives us a great introduction to a band driven on delivery, and giving us a new take on the Rock/Metal scene.